The past several weeks have been busy ones for sure! After I enjoyed Rome with my sister and Melissa, I came back to Milan and packed for my solo trip to Madrid. I've never traveled by myself before and part of my choosing to move overseas was to challenge myself to do things out of my comfort zone. So, in order to avoid the heat of my apartment I flew to Madrid for a few days of Spanish fun. Once again, thanks to my sisters amazing hotel discount I was able to stay at the Westin Palace. It was nice to stay in a plush and air conditioned place! Once in Madrid I navigated the metro system and wandered around the area near the hotel. I found a street side cafe and sat down for tapas and beer. It was a little odd eating alone, but the food was delish and I was proud of myself for taking on the challenge. I tried a tortilla in a soup form, which was salty and amazing. 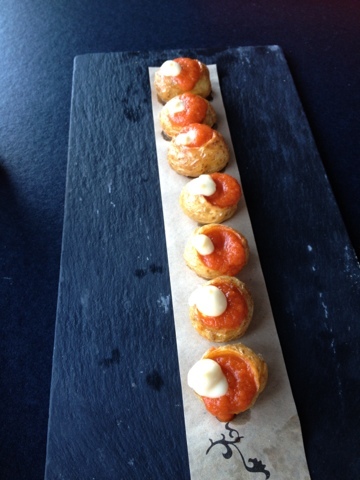 I also had a ham croquette and patatas bravas. My first full day in Madrid was spent at the Royal Palace and the Museo del Prado. I followed Rick Steves' walking tour through some major sites, including the Mercado di San Miguel. I had heard about it through a friend and found it to be a great place to be able to try lots of different foods without the pressure of eating alone and I was able to buy single tapas too. On Thursday I made my way to El Escorial, a palace that serves as burial grounds for the Spanish kings and queens, about an hour outside of the city. When I traveled to Spain in 1992, this was a highlight for me and I was curious if I would feel the same all these years later. This time I thought most of it was okay, but still was impressed by the room that holds the coffins of the Royals. The Royal Pantheon is a round room with green marble caskets on each side. Kings on the left, queens on the right, with the exception of Queen Isabel II, since she was a "ruling" queen and her husband was a consort. And, being a Queen is not enough to gain entrance. If you don't give birth to a son who becomes King you don't make the cut. The most recent addition is King Juan Carlos'grandmother, who died in the 60's, but was only recently moved into the room from the Rotting Room- seriously, you have to decompose for decades before you move into your final resting place. Unfortunately, the room is now full. Looks like King JC and his Queen are out of luck. 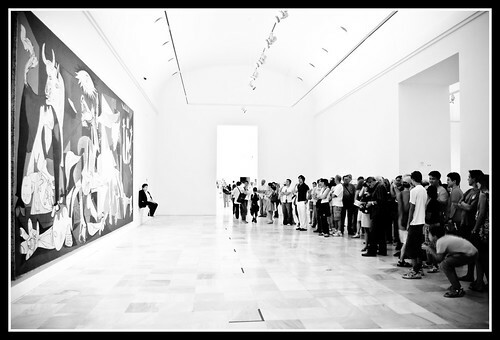 With some time to spare that night, I went to the Reina Sofia modern art museum to check out one of the most famous paintings in Spain, Picasso's Guernica. While modern art has not proven to be of much interest to me, this painting clearly exhibits the passion that Picasso felt about the bombing of the Spanish city, Guernica, and was quite striking. And, entrance to the museum was free, as almost all of the Spanish museums and sites have evening hours that are free to the public. Not to worry, I spent enough at the gift shop to make up for it! So, Madrid was great. 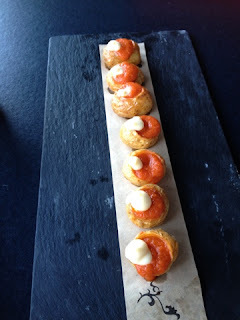 I'd like to go back with some others to eat my way through some more tapas! When I returned to Milan it was sweltering. Just in time for our new teachers to arrive and suffer through the August heat without air conditioning. Those first few days back were brutal...96, 97 and up. I took three showers on some of those days. It was impossible to stay cool! Some of the ASM staff...old and new in Bellagio! Our new teachers arrived and I had the opportunity to feel what it's like to be on the veteran side of things. We've taken them shopping and toured the city. 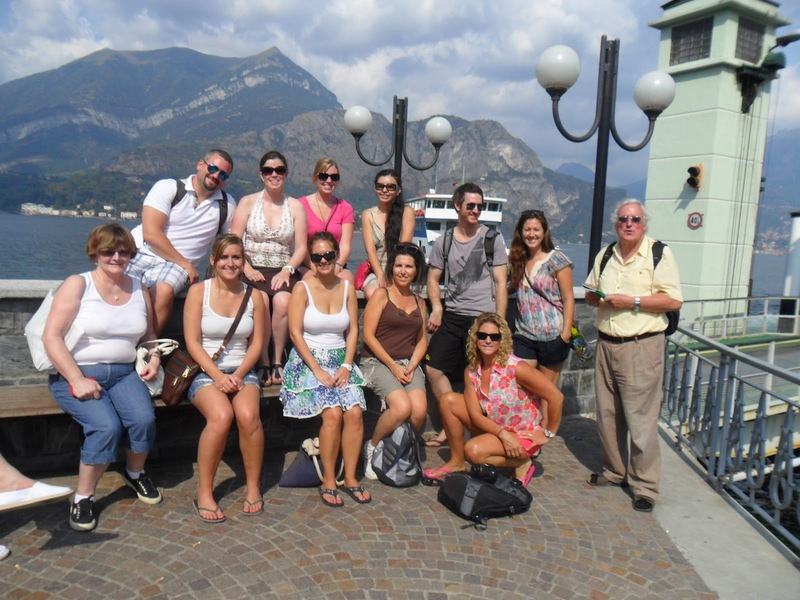 We've tried out public transportation and taken them to Lake Como. A lot of their experiences have reminded me of my own memories from just a year ago. The good news is that for now, at least, the temperatures have cooled off and living conditions are actually pleasant. I'm thankful for the reprieve, and hoping it lasts. School started on Monday for us. We were laboring here while my US friends enjoyed the day off. Since my schedule is less defined this year, I had more work to do for our week of pre-planning than I do for the first week of school. I gave three presentations last week and while I was really anxious about this, I'm pleased with how everything went. My job this year will involve a lot more of this, so I need to be as comfortable in front of adults as I am in front of a room full of munchkins. Practice makes perfect?